Update 11/2/11: Last week, I was asked by someone from my church to bring a pie to our Thanksgiving service. They remembered this pie from last year and they wanted me to bring this pie once again. I found this recipe on the The Pioneer Woman’s blog. 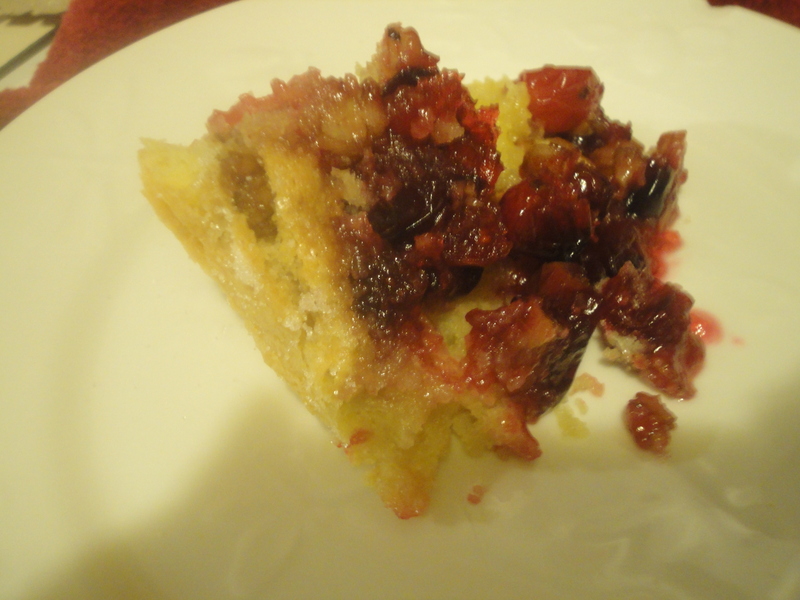 Since I love cranberries, I decided it would be perfect a Thanksgiving dessert. Before I could serve it to my whole family on turkey day, I decided to bake one and taste test it. The taste is devine. Since I was meeting with my pastor and his wife today, I decided to serve some of it to them. They gave it thumbs up. Now that it’s been tasted tested and approved, I’m definitely making it on Thanksgiving day. 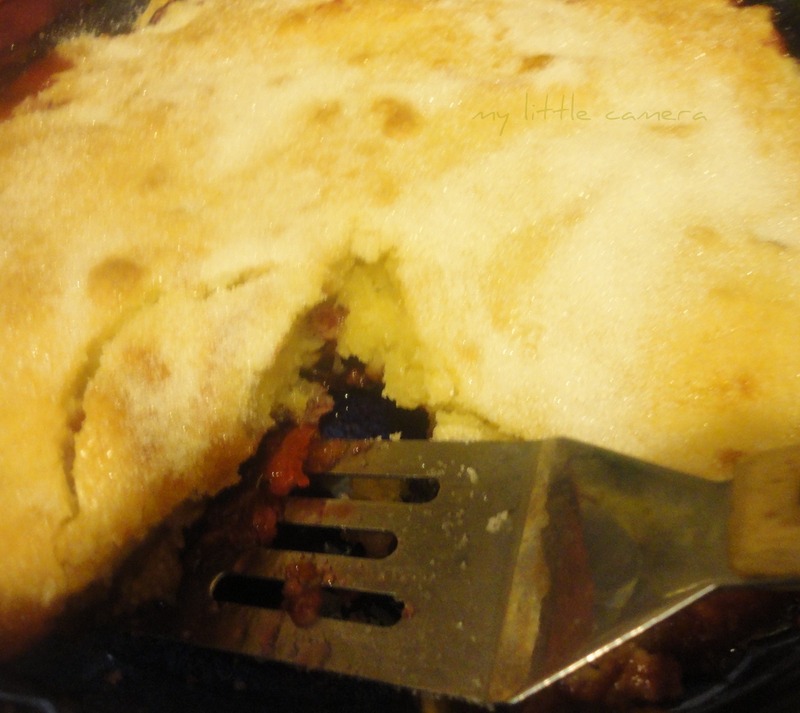 If I had to give three reasons why I love this recipe, I would say 1)It is easy to assemble and get into the oven; 2)The taste is amazing; and 3)I’ve never had a pie made of cranberries so it’s an unique recipe. Generously butter a cake pan or pie pan. Add cranberries to the bottom of the pan. Sprinkle on chopped pecans, then sprinkle on 2/3 cup sugar. For more great recipes, visit Colleen’s Kitchen Recipe Swap and Eat at Home’s Ingredient Spotlight Cranberries. 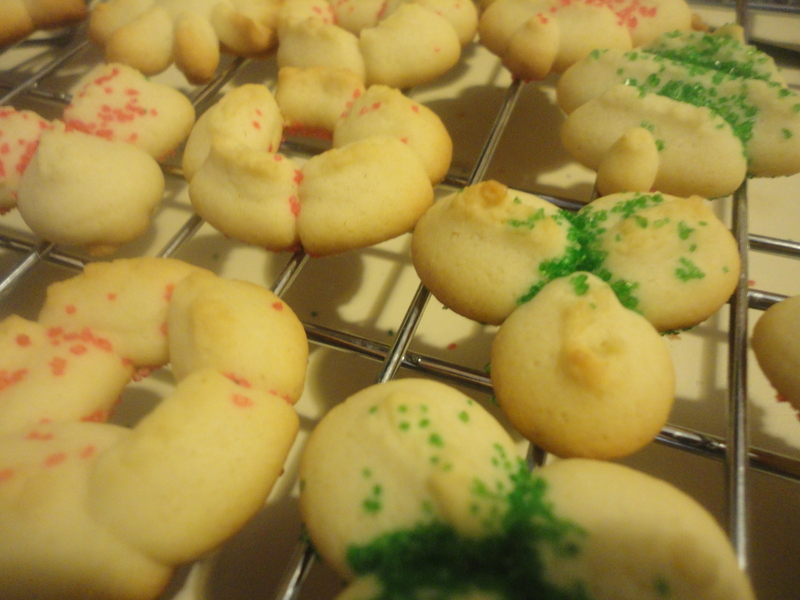 I love Spritz cookies. However, most recipes I’ve tried have been more work then necessary. After putting the dough in the cookie gun, I would have to pump it and most times it would not stay on the cookie sheet. It truly was frustrating. Rather then giving up, I looked for other recipes. Then I saw this Spritz recipe on the Domino Sugar website. So I decided to try it. Getting the dough onto the cookie sheet was not perfect at times. However, I was truly amazed at the ease of getting those cookies on the cookie sheet. After they finished baking, the Wee One and Imaginative One taste tested them. They both gave the recipe a thumbs up! Beat sugar and butter in large bowl until light and fluffy. Add salt, egg whites, egg yolk, almond extract and vanilla; mix well. Add flour, beating at low-speed until well mixed. For more great recipes, visit Colleen’s Kitchen Recipe Swap. This is a day late. I was working on paperwork for work last night that I needed to get done so I did not get this posted. Wednesday – dinner at Frisch’s Big Boy – We have coupons for free kid’s meals. I totally forgot that I had signed up to bring snacks to church today. Lucky for me, my mother-in-law reminded me. I quickly whipped up some of the Halloween sweet and salty treats – even though it’s not Halloween. Last time I brought them to church, people loved them. I also made some pumpkin chocolate chip granola bar bites. Then I was at a standstill of what else I could make. That’s when I decided to use my all star muffin mix to make some pumpkin spice muffins. I had some pumpkin puree left-over from the granola bar bites so it was perfect. 1/2 c. of melted butter (1 stick) – When I did this, I melted it in the microwave for one minute. 3 Tbsp. 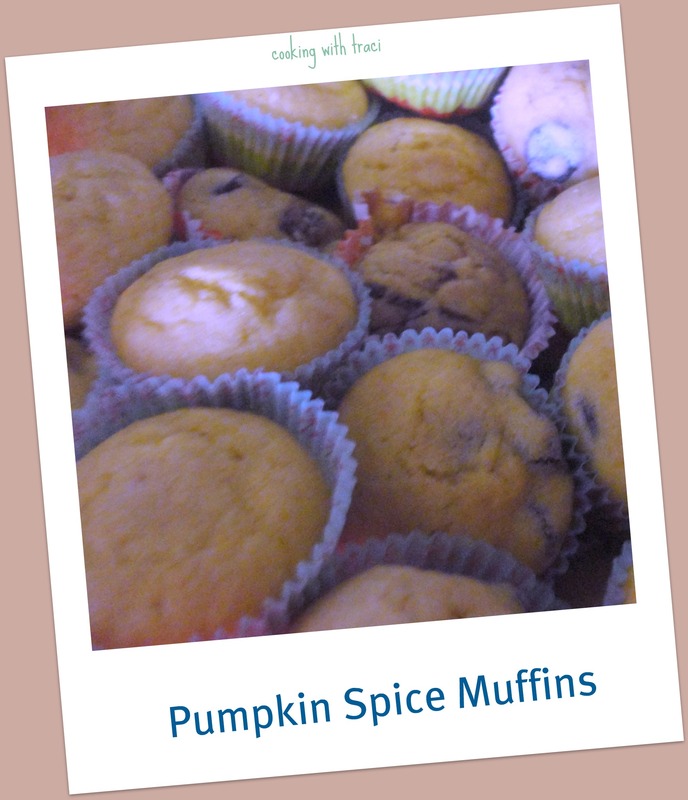 of pumpkin puree – When I made these, I didn’t know how the recipe would work when you added the pumpkin puree. You might want to add more. Place 2-3/4 cups muffin mix in a large bowl. Whisk the egg, milk, pumpkin puree, and butter; stir into dry ingredients just until moistened. Bake at 400° for 18-21 minutes or until a toothpick comes out clean. I made mini muffins this time. I ended up having 45 mini muffins. Instead of baking them for 18 to 21 minutes, I baked them for 12 minutes. I also added chocolate chips to half of the batter. Those turned out really delicious. This recipe has been linked to Colleen’s Kitchen Recipe Swap, Days of Thanksgiving, and Potluck Sunday. I can’t believe it’s already November. Thanksgiving and Christmas will be here before we know it. This week is going to be a busy week because I have parent teacher conferences on Monday and Wednesday nights. Election day is Tuesday so before heading home on Tuesday, I’ve got to go and vote. On Thursday night, I’ve got to go to the Imaginative One’s parent teacher conference. Friday night is chiropractor and then eating at Chick Fil A for dinner. The church that I attend MOPs at is building an addition to one of the MOPs’ members house. One of the fund raisers is with Chick Fil A. I decided that would be a nice way to begin the weekend after a long week. For more great menus, visit Menu Plan Monday.